October 02, 2018, 5:00 p.m. There seems to be constant debate among fitness enthusiasts about the optimal time to get a workout in: Morning? Night? Afternoon? 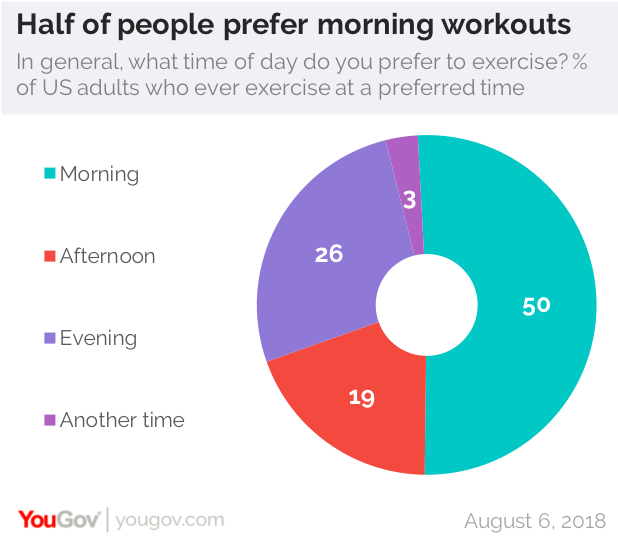 About eight in ten (79%) Americans say they exercise, according to new data from YouGov Plan & Track, and many are doing so in the morning. Of US adults who exercise at a preferred time, half (50%) prefer to do so in the morning. About a quarter (26%) of adults who ever exercise prefer to do so in the evening, while 19% like exercising in the afternoon. Overall, 21% of Americans say that they never exercise in the first place. 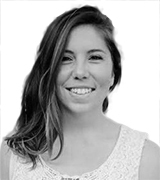 There are some slight generational differences: Millennials are the most likely to ever exercise in the first place, with 83% reporting that they do. Majorities of Gen X (83%) and baby boomers (73%) also say that they exercise at least sometimes. All three groups are likely to prefer exercising in the morning, but baby boomers are especially likely to say this. Over half (58%) of baby boomers who exercise say they prefer doing so in the morning, while only 16% prefer the afternoons and 18% prefer the evenings. In slight contrast, 38% of exercising millennials prefer morning workouts, while 19% prefer the afternoon and nearly three in ten (29%) like evening workouts. The time of day a person prefers to exercise may depend on their workout routine. According to data from YouGov Plan & Track, 49% of people who use yoga as a workout prefer doing so in the morning. An equal number (49%) of people who do bodyweight training with equipment also prefer morning workouts, as do 47% of people who lift weights when they workout. People who do pilates as a workout are less likely to say they work out in the mornings, with 34% choosing this option.